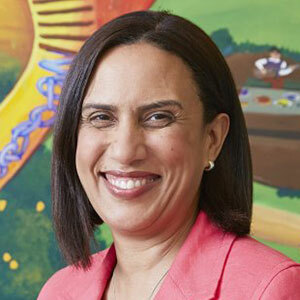 Dr. Bibbins-Domingo has expertise in cardiovascular epidemiology, particularly hypertension and chronic heart failure; racial, ethnic, and income disparities in health; and clinical and public health interventions aimed at chronic disease prevention. She is the director of the UCSF Center for Vulnerable Populations at Zuckerberg San Francisco General Hospital, and is also the director of the UCSF Clinical and Translational Science Institute’s training programs, which provide clinical and translational research education and training for researchers at all levels. Dr. Bibbins-Domingo earned her A.B. in molecular biology from Princeton University, where she pursued a joint degree in the Woodrow Wilson School of Public and International Affairs. Dr. Bibbins-Domingo spent 2 years at the University of Ibadan in Nigeria, where she earned an M.S. in chemistry. She earned her Ph.D. in biochemistry, her M.D., and her M.A.S. in clinical research at UCSF, where she completed her residency and fellowship training. She was also a Robert Wood Johnson Amos Scholar and a Kellogg Scholar in health disparities.